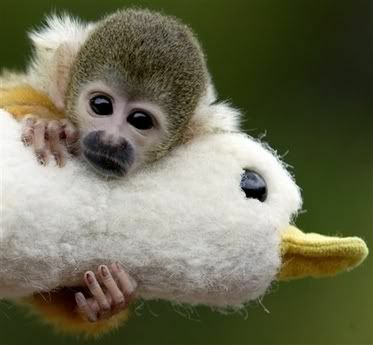 Orphaned squirrel monkey Loki clings to his toy duck at Taronga Zoo in Sydney, Australia, in this Jan. 19, 2006, file photo. Loki, who lost his mother shortly after birth eight weeks ago, has been hand raised by zoo staff and will be introduced to the rest of the Squirrel Monkey's when once he is weaned and learns to regulate his body temperature. You are still more adorable.